In 2018 the Greater Sacramento Economic Council, Sacramento Metropolitan Chamber of Commerce, Valley Vision, Sacramento Region Business Association, and the Sacramento Area Council of Governments partnered to engage the nationally recognized Brookings Metropolitan Policy Program to conduct a market assessment of the six-county Sacramento region. The findings of the Brookings market assessment show the Sacramento region can take advantage of changing market, technology and demographic trends for broad-based economic growth, but to do so must focus on the core drivers and enablers of regional competitiveness and prosperity. 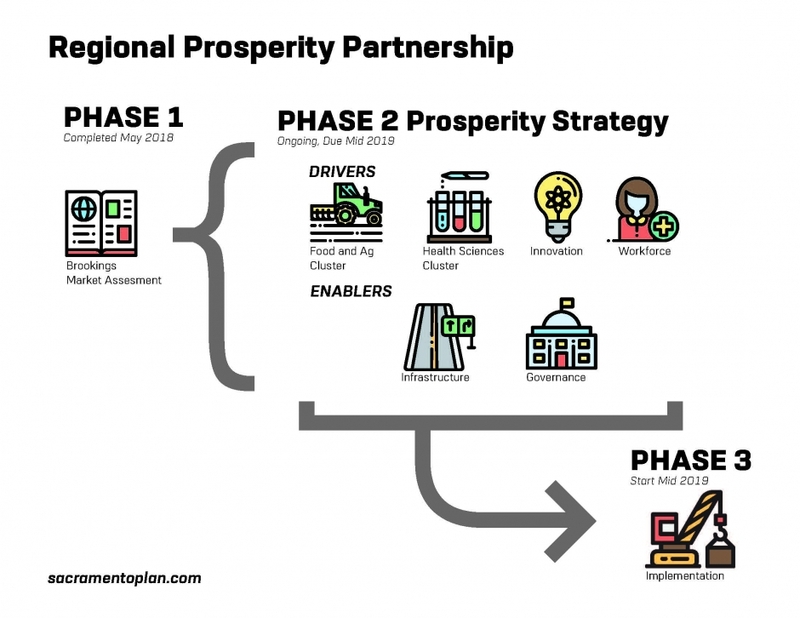 Responding to the Brookings call to action, the Regional Prosperity Partnership is developing the Prosperity Strategy, a strategic framework to champion a pathway for inclusive economic prosperity. The Prosperity Strategy Framework lays out the near-term approach to bridge the broad considerations of the Brookings market assessment with tangible steps to advance growth, prosperity and inclusion. The framework argues that preserving the region’s quality of life and reversing the downward trajectory of the last decade demands a renewed focus on the key factors of regional competitiveness and a shared commitment for targeted, near-term action that responds to the strengths, weaknesses, and vulnerabilities identified in the Brookings market assessment.